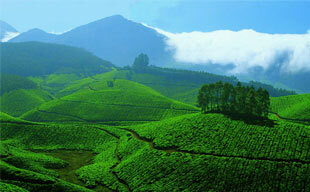 Kerala is famed for its equally enchanting village life as well, besides the presence of other prominent attractions. Blessed with simplicity, the villagers in the God's own country live their life at a languid pace and cherish each day in life with their hard work, skills and craftsmanship. This Village Life in Kerala tour is meant to enrich a traveller with virgin village lifestyle here. The tour might be small, but is seasoned with multifarious rural experiences for a heartwarming experience in the virgin backwaters of Kumarakom. The good side of this rural tour is that the tourism initiatives here will benefit the local community dwelling inside the virgin paradise of Kerala. Upon arrival at Kochi’s Nedumbassery Airport, meet Incredible India Tour Representative for assisted transfer to the hotel. In the noon, begin the sightseeing of Arabian Sea’s Queen, Cochin / Kochi. This is one of the finest natural harbours in the world, which once served as a major commercial and trade center for the British, Portuguese, Dutch, Chinese, etc. Visit Mattancherry Dutch Palace. This building was gifted by the Portuguese to The Raja of Kochi in 1555 as a goodwill gesture. Later, Dutch renovated the palace complex and since then, it is also known as Dutch Palace. This two-storeyed palace is an artistic specimen depicting Hindu murals in intricate detail. Also, the palace houses an impressive collection of royal palanquins, bejewelled outfits and other royal artifacts. Later visit 400 year old Jewish Synagogue which is Asia’s largest synagogue and a revered pilgrim center for Jews. This is also known as Paradesi Synagogue. Also visit the Jew Town Area, which was once a bustling port area and centre of the Kochi spice trade. Another prominent attraction at Jew Town is shopping for spices and antiques. Sum up the day with a visit to Kochi’s iconic attraction, Chinese Fishing Nets at Fort Kochi Complex. These cantilevered nets provide livelihood to many fishermen here who depend upon fishing. Later return to the comforts of the hotel for overnight in Kochi. After breakfast, check out Kochi for an authentic 'village experience' in the natural setting of Kumarakom. (85 km / 2 hrs) Upon arrival here, check in the local resort and spend the afternoon in the rural setting of Kumarakom. Begin the village tour post lunch from Kavanattinkara after briefing. This will be the guided tour, introducing tourists to the local customs, culture, traditions and livelihood of local Malayali villagers. Witness the enchanting beauty of the region aboard the boat ride on the backwater canal. This offers a panoramic bliss of villages dwelling within the greens of the region. As the backwater stretch comes to a halt after 45 minutes, alight the boat and stop over at Kandan Kavu. Here, a traveller will get to unfold the ultimate beauty of Keralan villages in the simplest way.Here, travellers get to discover the interesting local and traditional fishing practice using 'bow & arrows'. The locals utilize this practice to secure livelihood from the backwaters. A local fisherman with traditional gear accompanies the travellers to fishing outlet and displays his first hand usage for the skill. Optional fishing activity here. Scheduled next is the visit to Leelamani's house. Here, local women weave fringed coconut leaves into roof thatching and create a good thermal insulation for local houses. The speed with which they weave the leaves is commendable.At Leela's house, the next stopover of Village Life in Kerala Tour, the travellers get to observe the skill of making brooms using the veins of coconut leaves. The host with the help of guide will also explain the techniques involved in broom making. Followed by this is a visit to Sosamma's house where the entire family is engaged into Screw Pine Craft or Thazapaya. This is one of the oldest cottage crafts in Kerala; weaving the amazing handicraft mats, purses, carry bags etc, and makes a great souvenir of Kumarakom Village. In the evening, the rural tour will take the travellers to the backyard garden in a local farmhouse. Also visit the nearby Plantain orchard managed by the local Self Help Group unit. Plantains are a common sight in Kerala and are used diversely in the colloquial cuisine. They are available in different colours, sizes and varieties. At this orchard, one gets to see this prime ingredient of Kerala kitchen in its natural bloom. During auspicious days, Plantains plants are used with great interest. Even the traditional Sadya meal feast is served on a thick plantain leaf. Apart from that, there are numerous curries, desserts, fritters and snacks that use Plantains in abundance. After this enriching visit to farms, return to the resort in Kumarakom for a languid evening and overnight in this backwater destination. Venture into another side of Kumarakom Village after breakfast and visit Kaippuzhamuttu Bridge. Here, tourists can see the traditional duck farming in the backwaters. Scheduled next is a visit to the nearby farmyard where the intricate procedures of converting coconut husk into coir fibre can be observed. Followed by this is the visit to Nalini’s house. Here also, one can witness the different stages involved in coir making. Next, proceed towards Mohan’s Farm. This is a big farmstead where integrated farming is practiced. Run by Mohan, the farm club secretary, this farm accommodates a variety of crops, dairy farming and also has a fish pond featuring pearlspot, rohu, katla, prawns, etc. Here, one can also experience the toddy making process from the coconut tree. In this process, a toddy tapper climbs the coconut tree with a tapping kit to extract the sweet juice. This is a cumbersome procedure that requires acumen and expertise. These tappers are licensed people who are allowed to climb the long palm trees. Others are not allowed to climb the tree. Scheduled next is a visit to the lakeside where the conventional fishing methods featuring nets, rods and lines can be observed. A fish caught from here can also be grilled or cooked for lunch. Here, one can have the typical Kerala style lunch served on a plantain leaf. Fresh toddy juice and fish curry sourced from the locality will also be served as the lunch. Post lunch, a visit to Paddy fields is scheduled. Kumarakom is famous as the rice bowl of south India. This walk showcases the bountiful bird life of the region and the fields here are a part of Kumarakom Bird Sanctuary. Next in the itinerary is the visit to the organic farming at Sebastian’s Farm. Meet the owner here and enrich the knowledge of different techniques employed in cultivating crops organically. Further, stopover at Joychan’s farm. Here, the travellers meet with the secretary of the local farmers association and get to know the benefits of Responsible Tourism to the local community through organized agricultural practices. Refreshing tender coconut and bananas will be served in the evening here. Post evening session, hop in the country boat to Thankappan’s house. Here, the simplicity is the delight. Visiting a thatched hut on the canal banks overlooking paddy fields is a rare and a delightful experience. The last stopover for the day is at Pallichira. Here, the iconic country boat model awaits the traveller as a souvenir. Return to the resort for overnight stay. Day is free to relax. Optional visit to Kumarakom Bird Sanctuary at Vembanad Island. Return to the hotel for overnight stay. Check out the resort and return to Kochi Airport to board a flight towards the onward destination.